Can't Beet It: Baby's First Birthday Cake | Mealtime | Kids VT - small people, big ideas! For my oldest son Eli's first birthday, my dad bought him a cake from a fancy upstate New York bakery. The beautiful confection — a double-chocolate affair with ganache frosting — was so rich that I was afraid to let Eli dig in. I knew his little belly couldn't handle all that cocoa. He managed to stuff a few handfuls in his mouth before I confiscated his slice. But by the time I got him out of his high chair, he was wild-eyed with his first sugar high and looked like he'd taken a mud bath. When our second baby, Cal, approached the big No. 1, I was determined to do a better job. I made a super-healthy "cake" with whole-wheat flour, bananas and just a touch of maple syrup. It was nutritious — but not very festive or tasty. I finally got it just right when our youngest, Sadie, turned 1. Inspired by a British food blog, I whipped up a batch of adorable mini layer cakes, made with wholesome ingredients but still sweet enough to feel like a celebration. How did I pull it off? I mixed in beet purée to turn the cake pink. Use more traditional buttercream between the layers, or try this simple Greek-yogurt frosting — you can use beets to color it pink as well. It will taste as good as it looks! Preheat oven to 350 degrees and line a 12-cup muffin tin with paper baking cups. In a large mixing bowl, add the flour, baking powder and salt and whisk to combine. In the bowl of a stand mixer with a paddle attachment, or with a hand mixer on medium speed, cream the butter (or coconut oil) and sugar until light and fluffy. Add the egg, vanilla and lemon juice and beat on low speed until well combined. Add about half a cup of milk and mix on low speed until it's incorporated. Alternate adding the flour mixture and milk this way, mixing well after each addition, until all ingredients are combined and the batter is smooth. 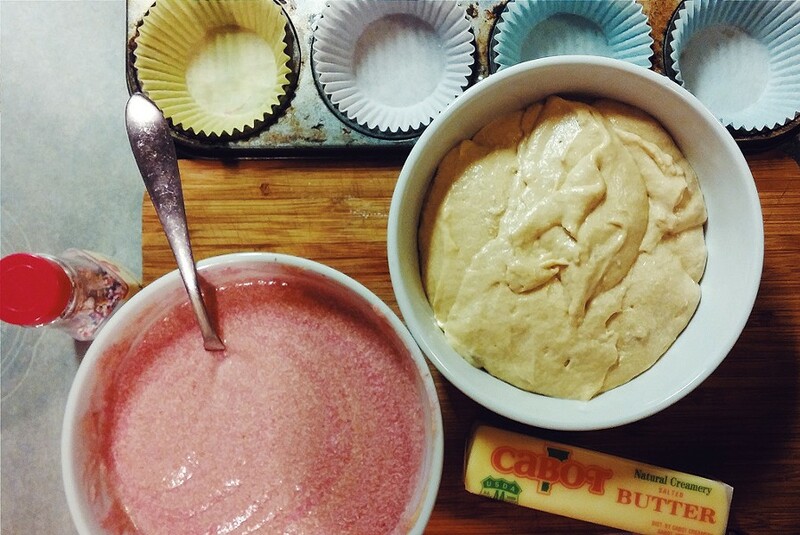 If you want your cakes pink, add the beet juice or purée. If you want to make pink and white layers, divide the batter evenly into two bowls, add beet juice to one bowl and mix well to combine. Fill the muffin cups about ⅔ full with batter and bake for 18-20 minutes. Cakes are done when the tops are set and a toothpick inserted into the center comes out clean. For pink icing, add a teaspoon or two of beet juice and an extra tablespoon of powdered sugar. Carefully slice cupcakes horizontally through the center with a serrated knife. If the tops are domed, use a knife to cut a smooth, flat top. Lay the top half top-side down on a tray and frost with about a tablespoon of frosting. Use a butter knife or the back of a spoon to spread frosting to the edges of the cake. Carefully place the other half with the bottom side facing up on top of the frosting, and top with another tablespoon of frosting, spreading it to the edges. 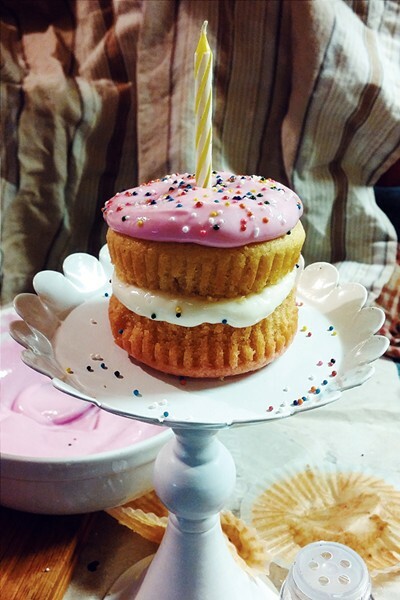 If you're feeling fancy, decorate with sprinkles.